Refrigerator Display or Demo mode is a feature built into refrigerators that completely disables the cooling components in the refrigerator and freezer. The reason for this is to conserve energy while the refrigerator is in a store as a display model. The lights and the digital control panel will still be operational. If you are having issues with your LG refrigerator, you may have purchased a floor model from the store or the refrigerator was on display or demo mode from the factory. 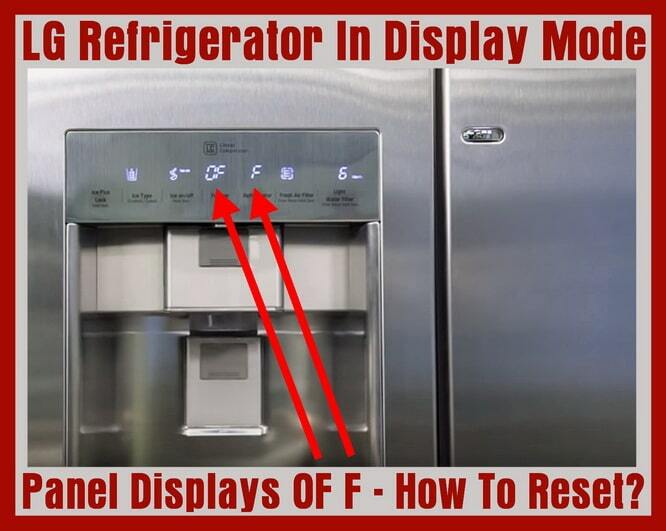 NOTE: The display panel on your LG refrigerator (whether vertical or horizontal) will show OF F or O FF. OF F is displayed on horizontal displays and O FF is shown on vertical displays. 1. Be sure the refrigerator is plugged in and you are seeing OF F on the display panel. 2. Open the right side door. 3. Keep left side door (where panel is located) shut. 4. Press and hold down the ICE PLUS/LOCK button and the REFRIGERATOR button at the same time. 5. Hold the buttons down for 3 to 6 seconds. 6. The panel will return to its normal setting and you will hear an audible “ding”. 7. The refrigerator dispenser will initialize. 8. The temperature numbers will appear on the display, set the desired temperature for the freezer and refrigerator. 9. Make sure the refrigerator is now cooling and the LCD panel is functioning properly. In other LG refrigerator models, you may see the LED scrolling from 1 to 7. 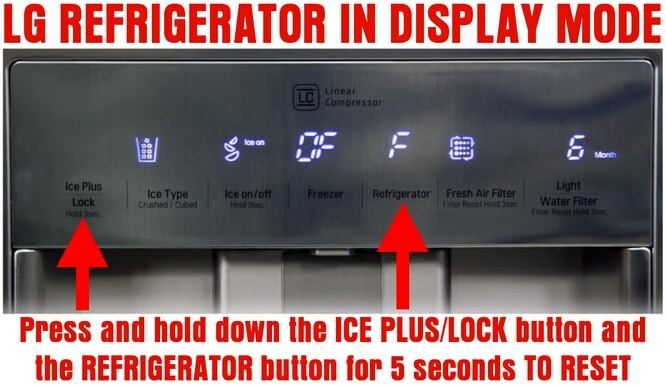 To reset this and get the fridge off of demo/display mode, you have to open the right door and press both the “REFRIGERATOR ADJUST” button and the “ICE PLUS” button for 3 to 6 seconds. If you buy a floor model refrigerator, scratch and dent refrigerator, or a refurbished refrigerator, chances are it will be in DEMO mode. Follow the steps above and you will have your LG refrigerator back to cooling and freezing. If you have any issues with your refrigerator not cooling, here is a page that can help you to troubleshoot the issue. If you have other error codes that display on your refrigerator panel, here is the LG refrigerator error codes page. If you have any questions about your LG refrigerator getting stuck in demo or display mode, leave us a question below and we will get back to you with an answer ASAP. Hi….went away for 2 days and come back and the fridge has lights on and the display still working..( no one at home to play with it)…but both fridge and freezer has stopped working….fridge only 9 days old…been working great for 8 days previous….LG insta-view Gf-V708MBSL. My lg refrigerator, model lnxc23726, will not keep display lit. Is not in Demo mode. Have researched and used the manual but nothing seems to work to keep the display lit. LG fridge Model # LFC23760SB , approx. 7yrs old, is slipping into demo mode by itself. This has happened 4-5 times in last 2 months. Any advise on this occurrence would be appreciated before we come home after an extended time away to find a fridge full of bad food. We have enjoyed all three LG appliance’s since we renovated our kitchen. please l have this error OF and F on an LG refrigerator model GSJ960PZBZ. l tried the above procedure that is pressing and holding down the ice plus and refrigerator buttons for 6 seconds but it did not work. Is there anything else l can do? also may l know the resistance of the Thermistors (about 4 of them 2 the freezer and 2 for the fridge side) at room temp? . How can l test the inside fan motor at the freezer compartment, it has 4 wires. The fridge compartment on top level isn’t cold at all. Temp at 3 degree C.
What could be the issue with this brand new fridge. Control panel getting error code = Fridge ER and Freezer IF. My LG 22860st Refrigerator seems to be in lock mode. None of the control panel buttons light up or respond to touch. Nothing happens when I hold down the lock button for three seconds, what else can I try? To deactivate the Control Lock function on your LG refrigerator, press and hold the CONTROL LOCK button for 3 seconds. DISPLAY OFF MODE: When your refrigerator is in Display Off mode, the LED display panel will remain off until a door is opened or a button is pressed. Once on, the display will remain lit for 20 seconds. If that does not work, unplug the fridge for 5 minutes and see if that resets the display board. If not, you may have a bad wire harness or a bad display board that will need to be removed and replaced. I just bought a floor model and am having the same issue with it being stuck in display mode despite me following the proper instructions. 1. Ensure plugged in and switched on. Display will “Bleep” and either show target temperatures or “OFF” depending on what you are doing. Thank you! The model number is LFD258$0ST. I had to turn it off at the power box – I couldn’t pull it out of the cabinet. That worked!!! But do you think the board is going bad and could I do that myself? Thank you. My LG refrigerator door display is resetting itself continuously! The refrigerator isn’t cooling. I’ve tried to see if it’s in display mode. Still not working. What is the model number of your LG refrigerator? In the meantime, try unplugging the fridge for 10 minutes, then plug back in and see if it MAY have reset the problem. Have you tried everything above to reset the error OFF MODE? Previous post: TV Screen Is Not Centered – How To Center TV Screen? Next post: Maytag Dishwasher Error Codes HE Models – Lights Flashing Blinking – What To Check?